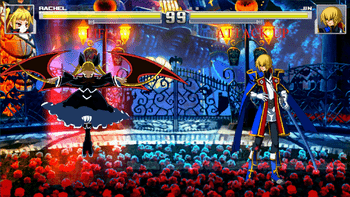 Rachel Alucard is a vampire in the Blazblue Series and currently the head of Alucard, a noble family. Since she hates boredom, she gets out of her castle to look for fun. She is referred to as 'Rabbit' by several characters because of her hairstyle. Although she hates her nickname, Ragna is the only person whom she can tolerate regardless of what he calls her. In spite of being the head of a noble family, she truly dislikes her vampiric desires. She tends to be spying on Ragna considering that she unintentionally turned him into a half vampire. She did this by giving Ragna some of her powers. This explains Ragna's healing and heterochromia abilities. As such, he is the only character in the series that knows of Rachel's existence. She likes entertaining herself by watching and playing with other characters. When Chrono Phantasma comes to an end, she asks to be killed by Tsubaki if they fail to kill Ragna. Apparently, she can produce a small pocket dimension, Rachel's interface with the dream world. Regardless of where she is going, Gii and Nago accompany her. However, she treats them poorly. Valkenhayn, who is her butler as well as her guardian, usually supervises her. It seems that she is the only character who understands the whole story and the fact that history is repeating itself. This explains her frequent interference as the game goes on. 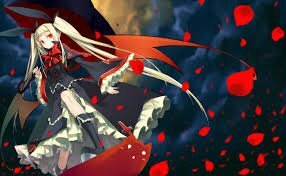 What makes Rachel an interesting character; is the possibility that she could be one of the most powerful characters in the play and the only one who is capable of bringing down Terumi. In fact, she has control over Tsukuyomi Unit, of which she uses it to guard Kagutsuchi from Nox Nyctores' attack. Because of her magical powers, she has a wide spread control over the wind and lightning.